Surface tension is caused by the inward attraction of molecules at a boundary. Surface tension is the energy required to stretch a unit change of surface area - and the surface tension will form a drop of liquid to a sphere since the sphere offers the smallest area for a definite volume. or as surface energy J/m2 or alternatively ergs per square centimeter. Common Imperial units used are lb/ft and lb/in. Engineering ToolBox, (2005). Surface Tension. 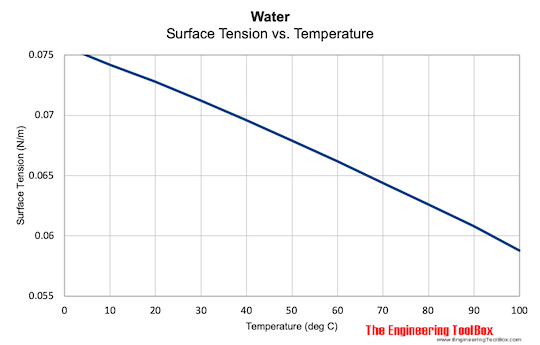 [online] Available at: https://www.engineeringtoolbox.com/surface-tension-d_962.html [Accessed Day Mo. Year].